'George H.W. 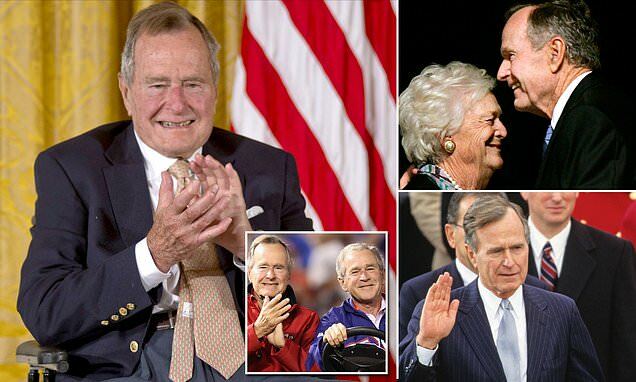 Bush was a man of the highest character and the best dad a son or daughter could ask for. The entire Bush family is deeply grateful for 41's life and love, for the compassion of those who have cared for and prayed for Dad, and for the condolences of our friends and fellow citizens,' the younger Bush added. President Donald Trump and First Lady Melania also paid tribute to Bush in a statement. 'Through his essential authenticity, disarming wit, and unwavering commitment to faith, family, and country President Bush inspired generations of his fellow Americans to public service - to be, in his words, 'a thousand points of light' illuminating the greatness, hope, and opportunity of America to the world,' the statement said. Other former presidents also weighed in with condolences on Bush's death. 'Few Americans have been—or will ever be—able to match President Bush's record of service to the United States and the joy he took every day from it; from his military service in World War II, to his work in Congress, the United Nations, China, the Central Intelligence Agency, the Vice Presidency and the Presidency, where he worked to move the post Cold War world toward greater unity, peace, and freedom,' Clinton added. 'While our hearts are heavy today, they are also filled with gratitude. Our thoughts are with the entire Bush family tonight – and all who were inspired by George and Barbara's example,' he added. The son of a senator and father of a president, Bush was the man with the golden resume who rose through the political ranks: from congressman to U.N. ambassador, Republican Party chairman to envoy to China, CIA director to two-term vice president under the hugely popular Ronald Reagan. He lost his bid for re-election to Bill Clinton in a campaign in which businessman H. Ross Perot took almost 19 percent of the vote as an independent candidate. Still, he lived to see his son, George W., twice elected to the presidency - only the second father-and-son chief executives, following John Adams and John Quincy Adams.